Colossians 1:27-28: God has chosen you to make known among the Gentiles the glorious riches of this mystery, which is Christ in you, the hope of glory. 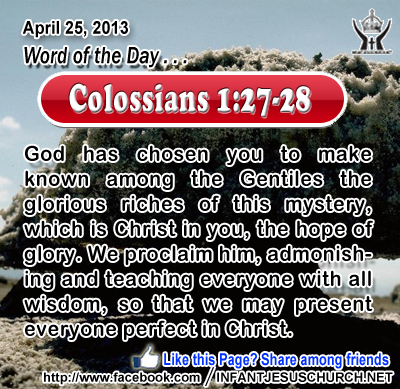 We proclaim him, admonishing and teaching everyone with all wisdom, so that we may present everyone perfect in Christ. Heavenly Father, may the presence of Jesus within us stir us to do your work today. May your abiding grace, through the presence of your gracious Son, call us to your character and your concerns. O Jesus, please make our heart like our Father's. Amen. 15And he said to them, "Go into all the world and preach the gospel to the whole creation. 16 He who believes and is baptized will be saved; but he who does not believe will be condemned. 17 And these signs will accompany those who believe: in my name they will cast out demons; they will speak in new tongues; 18 they will pick up serpents, and if they drink any deadly thing, it will not hurt them; they will lay their hands on the sick, and they will recover." 19 So then the Lord Jesus, after he had spoken to them, was taken up into heaven, and sat down at the right hand of God. 20 And they went forth and preached everywhere, while the Lord worked with them and confirmed the message by the signs that attended it. Amen. Go into the entire world and preach the gospel to the whole creation. This is the great commission which the risen Christ gives to the entire church. All believers have been given a share in this task - to be messengers of the good news and ambassadors for Jesus, the only savior of the world. We have not been left unaccompanied in this task, for the risen Lord works in and through us by the power of his Holy Spirit. Today we witness a new Pentecost as the Lord pours out his Holy Spirit upon his people to restore and strengthen the body of Christ and to prepare it for effective ministry and mission world-wide. Do we witness to others the joy of the gospel and anticipate of the resurrection? Loving Infant Jesus, through the gift of your Holy Spirit, you fill us with a strong spirit of praise and joy which no earthly trial can discipline. Fill us with your resurrection joy and help us to live a life of praise and thanksgiving for your glory. May we witness to those around us the joy of the gospel and the reality of your resurrection.